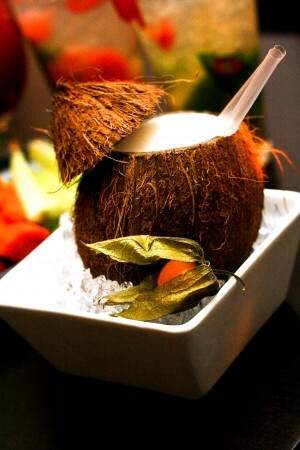 Healthy U-Akansha : Cheers to Coconut! A couple of days back, I met this lady, by the looks of whom one could clearly make out a typical day in her life. i am talking about the breed who have filthy rich spouses, have never done anything productive in life yet wear nothing less than solitaires and Swaroskis', do nothing at home except keep a track of Page 3 and arrange kitty Parties to show off their husband's money... (guess i should stop before my jealousy starts shouting loud and clear).The moment she came to know that i am a nutritionist, I was bombarded with questions and queries of all sorts. (like any other time when people 1st meet me..maybe I should write about those experiences too) All I could hear was 'what if...', 'how to..', 'Do I..' and so on..
Anyways, from all the clutter and confusion, what I could figure out was that she wanted to avoid the amount of junk she was consuming through all the colas and cocktails. She rightly pointed out that when we go out for parties, unhealthy food can be avoided..there are lot of choices but what about drinks? we just can't say no to a round of drinks. This is just one situation and I am sure lot of us face it at some point of time where we have to choose between saying no or upsetting people.Well my answer is simple.Go for Coconut water! 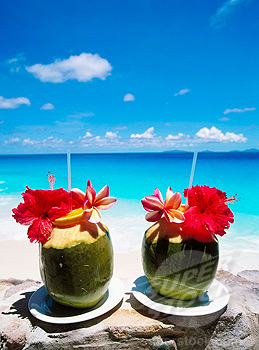 Its refreshing, healthy, trendy and a beverage with calories as close to plain water! Balance the Ph in your body and prevent cancer. Naturally replenish the body tissues after exercise. My fist drop-in . Nice read . Educating and refreshing . Keep sharing . i never used to take care of my health, after reading your blog posts , now started caring. its very good n helpful info. thnkyou keep writing. All the Best.